Model: SDSIBMPLT100. 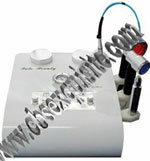 Microdermabrasion, Ultrasonic & Light Therapy. Microdermabrasion The uniquely patented MicroPeel Epidermal Skin System has been designed to treat both the face and body, allowing a wide range of skin problems, skin types and skin colors to be. New Edition 2007-2008. 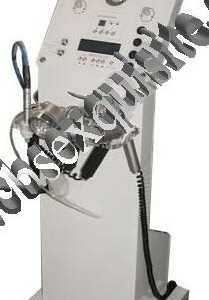 Microdermabrasion – Offers complete precision with maximum control and total flexibility in skin exfoliating. Aids in the production of new collagen and elastin formulation.The LED Light Therapy machine is the revolutionary and powerful means of using Concentrated Light for facial rejuvenation without any side effects! It is small, portable, and easy to use. Discover the many ways you will be able to treat a range of skin problems — including acne, stretch marks, cellulite, hyper pigmentation, sun damage and much, much more. Light therapy, an ancient knowledge combined with modern technology: for beauty and wellness combined. Model: SDSIBLT90. Light is as important to our health and well-being as the air we breathe and the food we eat. From the beginning of time, light has existed. Take it away, the body and mind will quickly deteriorate. Model: SDSIBLT90C. Light is as important to our health and well-being as the air we breathe and the food we eat. From the beginning of time, light has existed. Take it away, the body and mind will quickly deteriorate. item #SDSDT102. 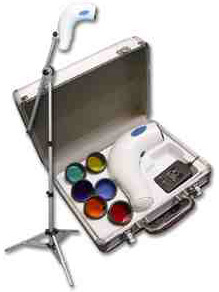 6 LIGHT COLOR LIGHT THERAPY: A BREAKTHROUGH WAY TO FIGHT THE VISIBLE SIGNS OF AGING AND SKIN DAMAGE. LTÂ® Concentrated 6-Light Therapy makes the most of the light around us by focusing it into a gentle, but still concentrated beam. Concentrated Light energy is projected onto the skin, promoting beneficial changes without being invasive. The machine gently delivers precise amounts of light energy through your skin’s surface. The energy is transported at specific settings for each treatment to maximize your results. It has a scope and flip filters to aid in the treatment This ground-breaking anti-aging method firms the skin and aids in cell renovation. Each color possess their own healing characteristics, which stimulates the body’s own healing powers. By increasing oxygenation, this non-invasive method reduces facial wrinkles, scars and the effects of sun damage. This safe and painless therapy is a solution for problematic skin conditions: hyper-pigmentation, scarring, burns, acne, wrinkles, and rosacea.“DIMENSION:“33" X 26" X 68"
item # SDS600.Light is as important to our health and well-being as the air we breathe and the food we eat. From the beginning of time, light has existed. Take it away, the body and mind will quickly deteriorate. Science has always recognized this fact but only in recent years, through modern advancements in biotechnology has Concentrated Light been duplicated. The LTÂ¨ Concentrated Light Therapy machine is the revolutionary and powerful means of using Concentrated Light for facial rejuvenation without any side effects! It is small, portable, and easy to use. Discover the many ways you will be able to treat a range of skin problems — including acne, stretch marks, cellulite, hyperpigmentation, sun damage and much, much more. Light therapy, an ancient knowledge combined with modern technology: for beauty and wellness combined.“FOR A COMPLETE INTRODUCTION AND GUIDE BOOK FOR THIS UNIT,PLEASE E-MAIL OR CALL US DIRECT.“DIMENSION:“13.5" X 9" X 5.5"
item #SDSDT100.“Photodynamic therapy is an emerging new procedure that is used by leading dermatologists and doctors worldwide. The latest in bio-technical research, LTÂ® Concentrated 7-Light Therapy makes the most of the light around us by focusing it into a gentle, but still concentrated beam. 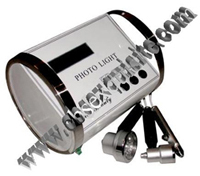 Concentrated Light energy is projected onto the skin, promoting beneficial changes without being invasive. Your doctor gently delivers precise amounts of light energy through your skin’s surface. The energy is transported at specific settings for each treatment to maximize your results. This ground-breaking anti-aging method firms the skin and aids in cell renovation. Each color in the 7-Light Therapy possess their own healing characteristics, which stimulates the body’s own healing powers. By increasing oxygenation, this non-invasive method reduces facial wrinkles, scars and the effects of sun damage. This safe and painless therapy is a solution for problematic skin conditions: hyper-pigmentation, scarring, burns, acne, wrinkles, and rosacea.“DIMENSION:“1" X 4" X 9". item #SDSDT104. “A BREAKTHROUGH WAY TO FIGHT THE VISIBLE SIGNS OF AGING AND SKIN DAMAGE.Concentrated 7-Light Therapy makes the most of the light around us by focusing it into a gentle, but still concentrated beam. Concentrated Light energy is projected onto the skin, promoting beneficial changes without being invasive. Your doctor gently delivers precise amounts of light energy through your skin’s surface. The energy is transported at specific settings for each treatment to maximize your results. This ground-breaking anti-aging method firms the skin and aids in cell renovation. Each color possess their own healing characteristics, which stimulates the body’s own healing powers. By increasing oxygenation, this non-invasive method reduces facial wrinkles, scars and the effects of sun damage. This safe and painless therapy is a solution for problematic skin conditions: hyper-pigmentation, scarring, burns, acne, wrinkles, and rosacea. 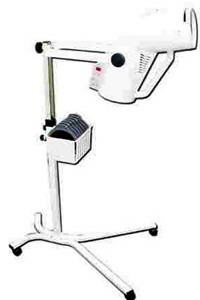 Professional 7-light therapy machine comes with filters.“.“FOR A COMPLETE INTRODUCTION AND GUIDE BOOK FOR THIS UNIT,PLEASE E-MAIL OR CALL US DIRECT..“`DIMENSION:“32" X 32" X 54".